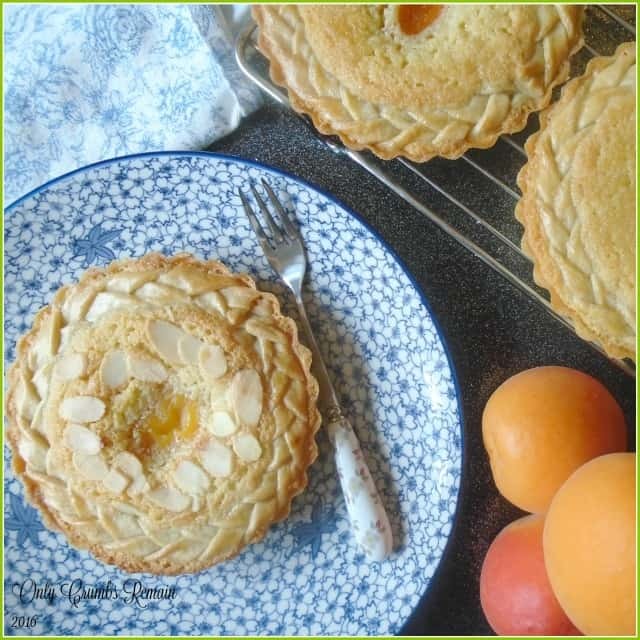 These individual tarts, decorated with a pastry plait, are delicious with a clear almond flavour which is complemented by the addition of apricots and orange. Although generously sized, they are the perfect afternoon treat when served with your favourite drink. In recent weeks I’ve become mesmerised by images of beautiful pastry designs which adorn the tops of pies and tarts over on Instagram. We’re not just talking about the classic basket weave here, which in itself is very effective, but rather flowers, cutouts and other such intricate designs. So being a huge fan of making my own pastry I promised myself that my next appropriate bake would be finished with some sort of pastry decoration. 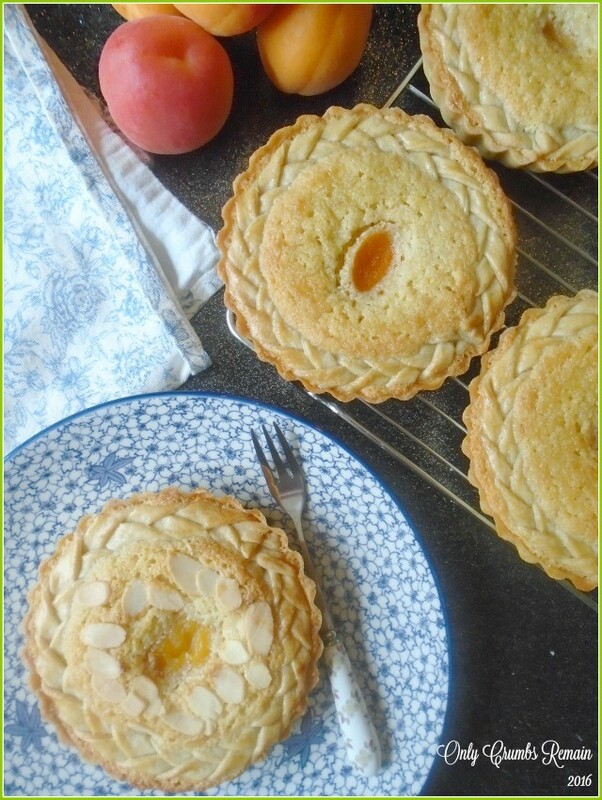 The desicion was what to make, but having an open bag of ground almonds in the cupboard which was rapidly approaching its best before date Mr E & I decided to make some frangipane tarts. Frangipane is the classic almond mixture used in bakewell tarts which lends itself nicely to having fruit added to the bake. Although pears are often used to accompany frangipane, as with our Pear & Blackberry Frangipane Tart which we made last autumn, I decided to ring the changes a little here. I chose to use both apricots and oranges having learnt that both complement almonds beautifully. Tarts. Not only are they ready stoned, but they were also beautifully ripe and a lovely size to sit within these individual tarts. Some of these tarts were sprinkled with flaked almonds too, and I have to admit Ido prefer the aesthetics of those compared to the ones without the flaked almonds. Returning to the pastry. Rather than making the pastry decoration overly intricate I decided to edge the tarts with a simple plait (braid) made from the off cuts of the sweet pastry, often referred as pate sucree by professional chefs. Although it doesn’t have the same impact as those I’ve seen over on Instagram it still gives a pretty finish. Of course the three strand plait (braid) is simply there to indulge my love of pastry and certainly isn’t a necessary element to the bake, but it does add to that ‘eat me’ invitation sent out by the tarts themselves. The pastry plait / braid really isn’t difficult to make. Once the tart cases were lined the off-cuts were re-rolled into a long oblong which was then sliced into narrow strips. These were then gently plaited (braided), trying to avoid stretching the pastry, and then set aside to rest whilst the other elements of the tart were made. 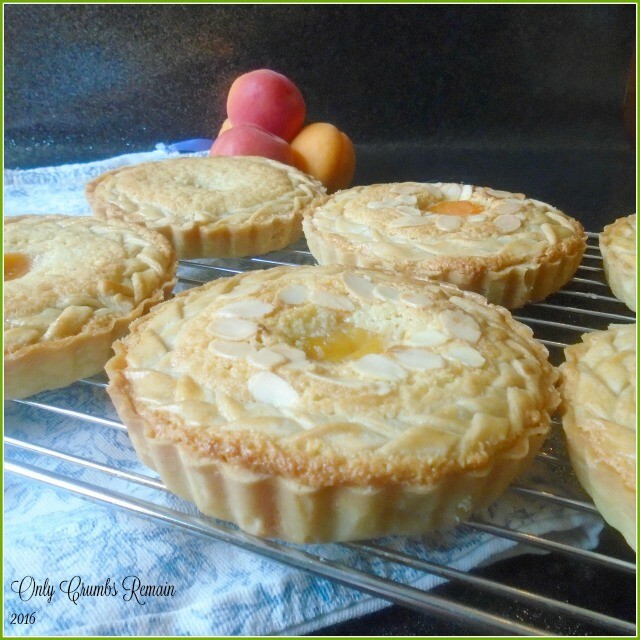 These generously sized individual Apricot & Orange Frangipane Tarts with the beautiful crisp flavoursome pastry were absolutely delicious, and made a wonderful change to the flavours classically used. 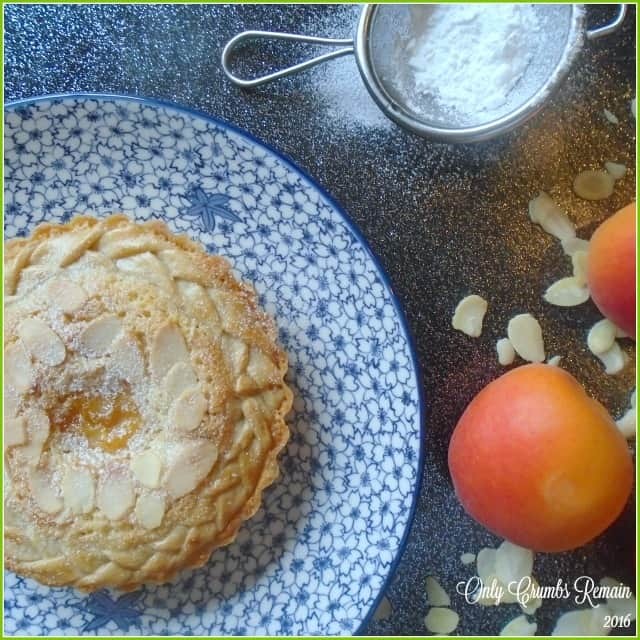 The three elements of almond, apricot and orange worked really well together, and although the predominant flavour was almond, as you’d expect from a frangipane, the orange flavour could still be detected in the background. As anticipated the layer of orange curd sandwiched between the pastry and frangipane sponge couldn’t be seen but the flavour was still detected. The tarts were shared amongst local family, my parents have already requested another batch to be made as did my uncle. Mr E, who is a little unusual in liking whole almonds but not frangipane, tried a bite and proceeded to eat the whole portion. He commented that, for him, the orange element helped to make the almond flavour less strong. with a clear almond flavour which is complemented by the addition of the two fruits. Although generously sized, they are the perfect afternoon treat when served with your favourite drink. your thumb and finger tips until the mixture resembles breadcrumbs. place into the fridge to chill for at least 30 minutes, (see note b). 2. Line the tart cases. Remove the pastry from the fridge and divide into 6 pieces of roughly equal size. Place one portion onto a lightly floured work work surface, lightly covering the remaining 5 which have been set aside. Roll the pastry out until it is about 2mm thick. it sits into the edges well and picks up the shape of the fluted sides. If the pastry tears, patch it with surplus pastry. Avoid strectching the pastry. Line the remaining tart cases in the same way. pastry base. Place into the fridge to chill for at least 10 – 15 minutes. to house the tart cases. out. Gently lay it on top of the pastry, easing it into the edges. Weigh the paper down with baking beans or uncooked rice or pasta. Repeat with the remaining 5 cases. baking tray in the oven. 7. Meanwhile, make the pastry plaits / braids (optional). Gather together the off cuts of pastry into one clump. Re-roll it into a neat oblong around 50cm long and about 2mm thick. With a small sharp knife trim the pastry to neaten the two long edges. Remove the off-cuts. Cut long strips of pastry measuring around 1cm wide and retaining the 50cm length. Aim to have in excess of 18 strips as the extras will be useful in case of any tears to the pastry strips. Gently lift 3 strips of pastry, one at a time, and lay them on a flat work surface alongside each other. Attach the far ends of the pastry together. Gently plait the strands, aiming not to stretch them. Gently lift the right hand strip of pastry over the centre strip so that it now lays in the centre. Gently lift the left hand strip of pastry over the centre strip so that it now occupies the centre position. Repeat until the full length of the pastry is plaited. Press the finishing ends of the pastry together to secure. Use a knife to neaten the end of the pastry. Set aside to somewhere cool and repeat to make five more plaits. 8. Reduce the oven temperature to 180c / 160 Fan / Gas 4. 9. Trim the pastry cases. Use a small sharp knife to trim the excess cooked pastry from the pastry cases. Hold the knife horizontally. Slowly and carefully trim away the excess so that the top of the pastry case is flush with the metal housing. and fluffy. Add the almond extract to the lightly beaten eggs and mix. well after each addition. Sieve the ground almonds into the mixture. Fold the almonds in gently using a spatula or large metal spoon. 11. Prepare the fruit. Empty the can of breakfast apricots into a bowl. Select 6 nice fruits which have been stoned but are still whole. Rinse these under water to remove the syrup. Dry them on with a sheet of kitchen roll. Set them aside. 12. Start filling the pastry flan. frangipane if necessary. Avoid over filling the cases with frangipane as it will puff up and rise a little as it bakes (if you feel it is over full remove some with a teaspoon). 13. Apply the pastry decoration (optional). Gently lift a strip of the plaited pastry. Lay the neatest end of the pastry onto the frangipane, butting upto the pastry shell. Slowly rotate the pastry case around whilst continuing to lay the pastry down into a neat circle. Trim off the excess pastry with a pair of scissors. With a pastry brush lightly apply a little beaten egg to the plait, avoid getting it down the side of the pastry case which is likely to result in the tart sticking to the metal case during the make and therefore making it harder to remove. 14. Finish filling the flan cases. Place one of the prepared apricots into the centre of each tart. Avoid pushing it down into the frangipane. Scatter the frangipane with a few flaked almonds (optional). the oven and set aside on a cooling rack to cool. 16. Remove from the tart cases. After 4 or 5 minutes of cooling remove the tarts from their cases and return them to the cooling rack to finish cooling. 17. Dust with icing sugar. 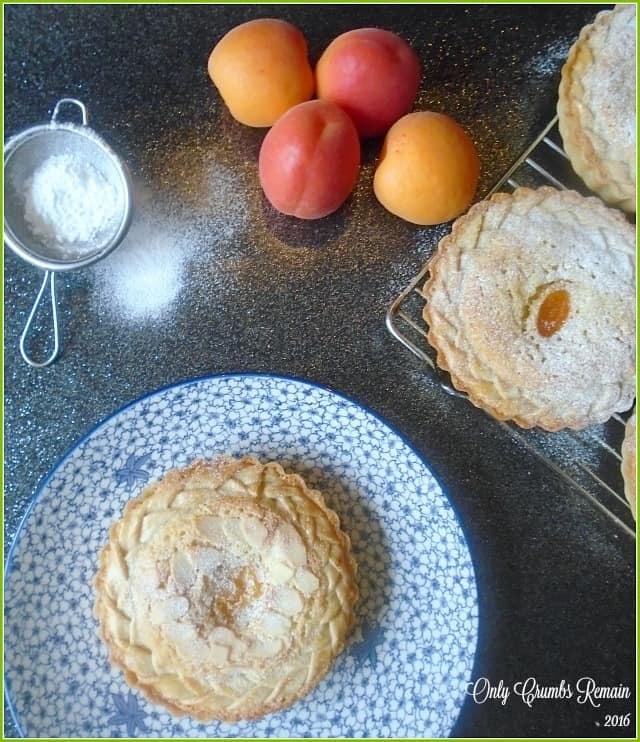 Once the tarts are fully cool, you may want to dust them with a little icing sugar. Enjoy served as they are or with some fresh cream. Beautiful warm or cold. a) Rather than using the 12cm tart tins, the bake would work equally well made both larger or smaller, though you will need to adjust the baking duration. b) The pastry can be made a day or two ahead of time and kept wrapped in the fridge until required. You may need to remove it from the fridge 10 minutes or so before rolling if it is overly firm. c) Personally I find rolling the individual portions of pastry far easier than handling and turning a large sheet of pastry. d) Depending upon the size of your baking tray and your choice of tart tins you may need to batch bake the frangipane tarts, as I did. e) The heated baking tray makes it a lot easier to remove the tarts from the oven without having to handle the actual tart case. f) When handling the pastry try not to add too much flour to the work bench. Also avoid stretching the pastry strips when plaiting / braiding them. I love a bit of frangipane. Throw in some apricots and I'm in my happy place! I've just pinned it. I'm with you there Mel, frangipane and apricot…..they were absolutely delicious. Thanks for pinning. I've been loving all of the fancy pastry work that's been around recently too, your tarts look so pretty with the plait around the edge! And they sound delicious. Thank you for linking up with Treat Petite. Some of the pretty pastry designs are absolutely amazing aren't they? What beautiful tarts. The decorative pleated edge is so effective and I love the sunshiney apricot centre. The flavour combinations sound delicious as well. These are beautiful and the pastry decoration is amazing! I am also really impressed by the decorations I see on various tarts and pies online – I haven't tried it myself though so I am thoroughly impressed! There are so many delicious pastry decorations out on the net aren't there? I have to say it really wasn't difficult at all, as long as you know how to do a three strand plait of course 😉 The only thing I would say though, if you do try a pastry decoration, would be to halndle the pastry ultra gently to avoid stretching it. Oh heck yes, they certainly did taste amazing Eb. I really wsn't expecting the apricot, orange & almond to get on quite as well as they did. Instagram is absolutely brilliant, they're so many great ideas on there.